Shop at Willy Street Co-op to Support Double Dollars – Community Action Coalition For South Central Wisconsin, Inc.
Willy Street Co-op is supporting the CAC Double Dollars program for the month of July! For every reusable bag used, the Co-op will make a $0.10 contribution, and for every reused paper or plastic bag, the Co-op will make a $0.05 contribution. 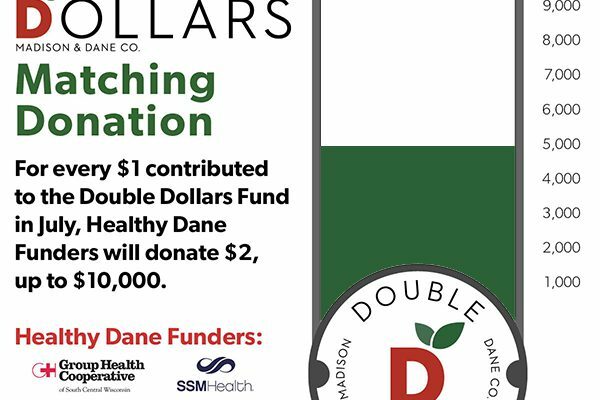 To make a donation to the Double Dollars Fund, shoppers can go to any Co-op location and purchase a tax-deductible $1, $5, $10, or $25 “Double Dollar Fund Card.” From July 1 until July 31, Healthy Dane Funders is offering to triple any contribution made at the Co-op up to $10,000 toward the Double Dollars program. Co-op shoppers who are able to extend a helping hand to neighbors in need can now do so even more effectively through this match effort. Every contribution will be matched, whether people donate at the register or use their own bags to shop. We’re already over halfway to our goal – help us reach the rest so we can provide fresh and local food to everyone!